Soft and tasty, our Pains au Lait can be enjoyed at any moment of the day. Enjoy with your favourite spread or why not try as a savoury treat instead? We have continued to bake our traditional Pains au Lait which has become one of our most iconic brioche products. We use only the finest ingredients to make a tasty, airy milk brioche roll that is perfect for all of the family. It was all started in 1936 by Gabriel Pasquier in a small village bakery at Les Cerqueux, France. In 1974, his five sons began building the family business into 'Brioche Pasquier', which now employs over 3,000 people across Europe. Today, we raise our dough using our own traditional "levain", following the same original baking method Gabriel used, which delivers a unique taste. And we ensure that all our recipes are free from artificial colours, flavours and hydrogenated fats. 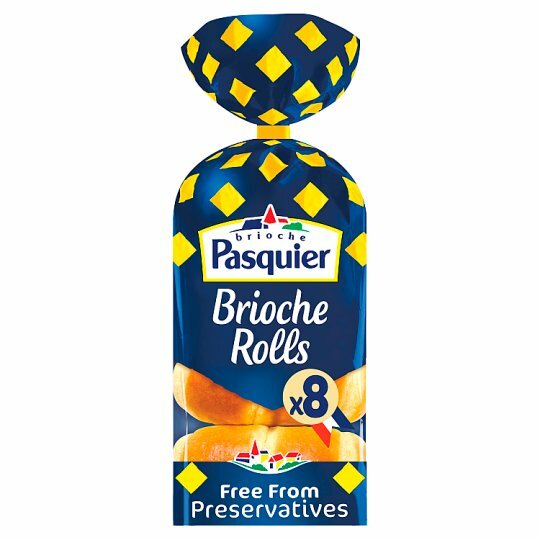 With over 4 million Brioche Pasquier products enjoyed every day, it is little wonder that we are the No. 1 brand in the brioche market. Bon appétit! It truly is France's favourite! PITCH, the tasty filled brioche great for kids. Perfect for breakfast, as a snack or to put in your lunchbox. Plus it's free from preservatives and hydrogenated fats. Store in a cool dry place. Once opened, seal tightly with bag tie., Best before: See side of pack.